There’s one thing you can count on as you develop your career – you’re going to have to write a resume many times throughout the years. Not only do I coach people on creating resumes, I also review them for companies. I’ve seen a lot of resumes! Some have been great – well-organized, professional, truly impressive. But I’ve also seen many that have missed the mark, and most of the mistakes are easily avoidable. It should be a given that your resume must be completely honest, but since this is a list of “nevers,” I can’t neglect to mention this point. Avoid the temptation to round up your GPA, pad the results of your project, or embellish your job responsibilities. It’s common for hiring managers to fact-check your resume, and you can also expect questions during the interview that will dig into your experience. If they catch wind that you haven’t been completely honest, you’ll be eliminated. For one, it is a waste of valuable real estate on your resume (see point #3), but it also disregards a key principle – when you’re interviewing, it is all about the employer. It’s great you have a goal of becoming an attorney, but if you’re not applying for a position as an attorney, why are you mentioning it on your resume? Listing goals that can’t be accomplished in that company is a sure-fire way for your resume to end up in the “Pass” pile, and for you to be labeled as someone who is out for him/herself, didn’t care enough to read the job posting, or both! Your resume needs to focus on what you can offer to help that company succeed. As much as we’d like to believe that the person reviewing your resume is reading every word, they just have too many to get through to do so. Studies have shown resume reviewers only spend 7-45 seconds on each resume, so make each word count. A good rule of thumb is to make your resume one page for every ten years of work experience according to Laszlo Bock, Google’s hiring guru. It’s assumed you’re putting your best foot forward with your resume, so if you make any spelling or grammar mistakes, that speaks volumes to what your work will be like on a day-to-day basis. Go the extra mile in proofing your resume. First, read it over a couple of times looking for errors. Then, use a tool like Grammarly as a second pass to catch mistakes. 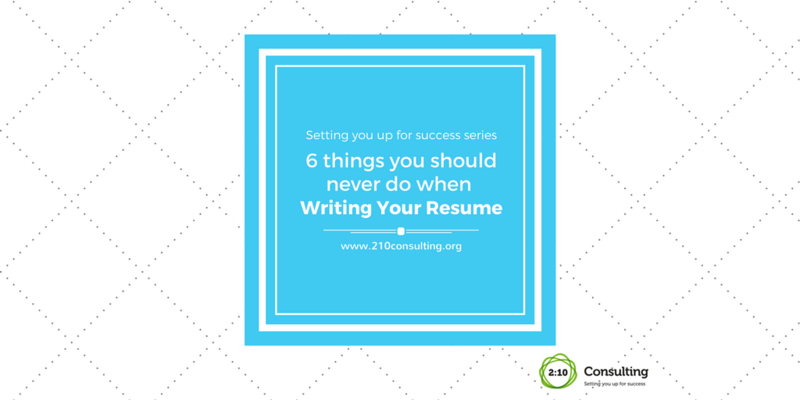 For added precaution, have a detail-oriented friend or two proofread your resume for you. Finally, print it out and check it yourself one last time by reading it aloud for good measure. Check out Toni Bowers’ good tips for checking for errors also. You’d be surprised how many resumes I see that don’t include an email or phone number, or that contain errors in their email, address, or phone. Never a good impression when the individual hasn’t shown the care to make sure their contact information is correct. Always include your full name, cell phone number, and professional-sounding email address. If your email address is something like StarTrekRules@aol.com, it sounds like a carry-over from high school and may cause the hiring manager to question your professionalism. Why put any doubt in their mind? I also think it’s ideal to include a reference to your LinkedIn profile and your full address (if you’re not comfortable including your full address, at least include your city and state). One more suggestion – make sure your voicemail greeting portrays you in a professional light by speaking clearly and in a positive tone. Realize that hiring managers review hundreds of resumes for open positions. They don’t have time to thoroughly read every.single.word until they’ve narrowed down their list. Make it easy on them by creating your resume with a simple format and use bullet points whenever possible. Aja Frost says a good guideline is to use only two lines (max) per bullet point. Remember your resume is a marketing document, so choose your words carefully to make it easy for the hiring manager to see why you’re a fit for the position. Finally, save your resume with your name in the title and submit it as a PDF whenever possible to maintain the formatting you carefully created.